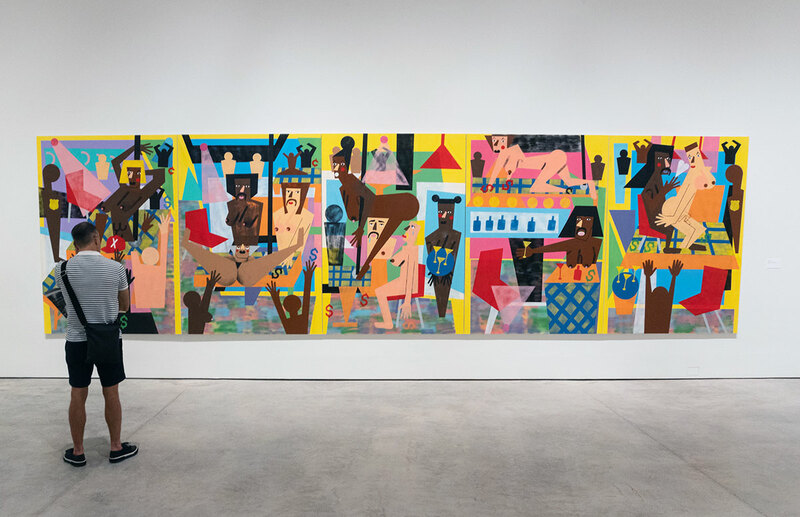 In her exhibit, Nina Chanel Abney, a modern girl living in a post-modern world, addresses racial inequality, gender discrimination and injustices using representation and abstraction. It’s up to viewers to figure out the messages in this off-the-wall party. There’s some kind of party going on at the New Norton‘s Neon exhibit by New Yorker Nina Chanel Abney, who depicts strip clubs and bikini bashes where wild graphics abound. Her characters, rendered in flat, geometric shapes, cavort and sprawl in scenes that become shockingly more bizarre the longer you look at them. Nina Chanel Abney is no stranger to controversy, having once painted her classmates at art school as black inmates while she became the blonde-haired jailer. The main large painting in the Neon exhibit —all the works are untitled— reads almost like a graphic novel with five scenes strung together, separated by lurid yellow lines. Yes, those are strippers crawling on stages, giving lap dances and serving up cocktails in the new Norton gallery. Money signs float in the air and lay on tables, because that’s what makes the x-rated world go around. Gender fluidity permeates another work that mixes black and white people’s body parts together for a confusing picnic as small American flags, phallic symbols, and maybe even a suspicious certain red trucker hat float around the outdoorsy scene. Riffing on French Impressionism, this updated scene is bizarrely joyful. An adjacent painting is even more confusing as babes in orange bikinis sport mustaches and kick balls around against a black and white checkered floor while waving their arms in the air. Abney may never tell, she addresses racial inequality, gender discrimination and injustices using representation and abstraction. 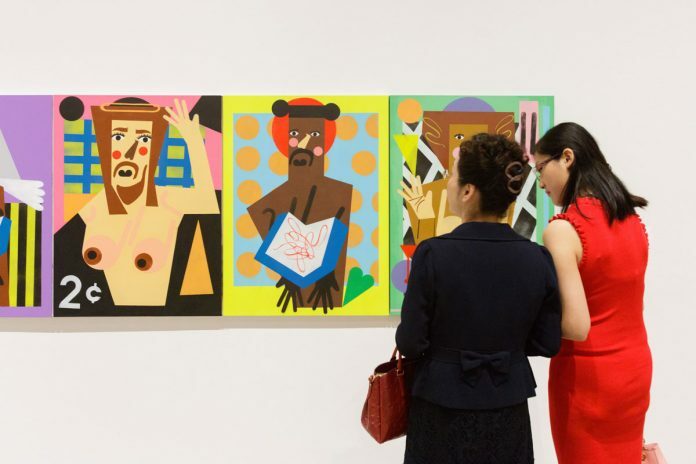 Inspired by Romare Bearden, Stuart Davis and the sharp-edged cut outs of Henri Matisse, she provokes and confronts. A modern girl living in a post-modern world. Abney treats the canvas “like a journal in that it’s a place where I can release any concerns, emotions, and just the different thoughts swirling around in my head in general.” If the images leave viewers confused, that’s okay. Then it’s up to viewers to figure out the messages in this off-the-wall party. Abney was born in the windy city of Chicago and currently lives and works in Brooklyn, New York. Her work is included in collections worldwide including the Brooklyn Museum, The Rubell Family Collection in Miami’s Wynwood,The Bronx Museum, and Hong Kong. The Neon exhibition at the Norton museum of Art is curated by Cheryl Brutvan, Director of Curatorial Affairs, and is accompanied by a publication. To visit the museum and view Nina Chanel Abney’s Neon exhibit, check their website www.norton.org/exhibitions for dates, hours and admission. Neon is the seventh exhibition of RAW—Recognition of Art by Women.